Which is the cheapest? Compare! Skis rental Auvergne : compare ! Compare ski lessons in + 500 ski resorts! Ski down in Auvergne, then have a break and observe the wild landscapes that surround you : you are already charmed ! 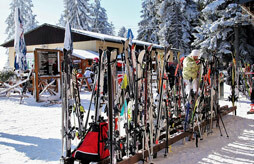 Whether you ski in Auvergne or you walk with snowshoes, you will find all the pleasant assets of the mountain at hand. With different ski resorts adapted to family holidays, come and discover skiing in Auvergne which also offers many leisure besides skiing, and different outdoor activities.